1 year ago a female 44 y.o. was operated on the femoral shaft and neck fractures 2 weeks after a car accident. 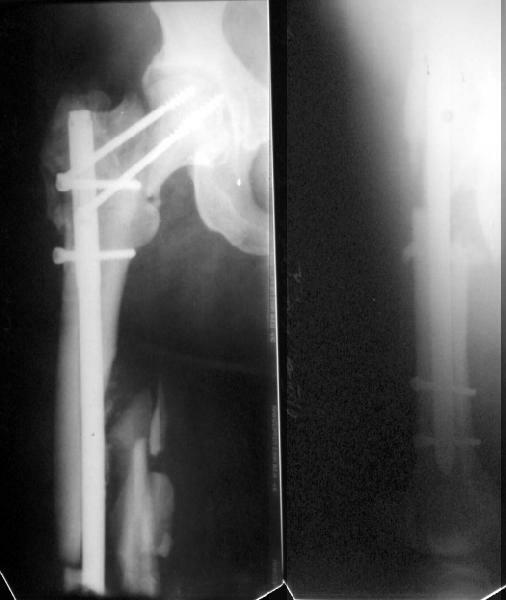 Closed interlocked nailing was performed, and the neck was fixed miss a nail with poor result mostly due to her obesity - femoral circumference is >80 cm (image 1). The nail has just been removed through old incisions. The neck is not healed, the shaft is partially healed (image 2). What next? At the moment we think about valgizing osteotomy with blade plate 130 degrees. Maybe with retrograde nailing though it looks only a little space between the plate and fracture. Hip prosthesis with a long stem is not available. Her obesity is the same. Any more idea? I vote recon nail with single large hip screw( Smith and Nephew or Howmedica make them). Reaming will provide endosteal graft for diaphyseal fracture,and I would bone graft the femoral neck via the lateral thigh wound. Do you mean nailing without the valgus osteotomy? yes. 135 deg nail, although higher angles are available. just compress the fracture and bone graft. This is a good example of sub optimal placement of the neck screws. Young patients with neck/shaft combo fxs have a high Pauwel's angle. This is counteracted by open reduction and internal fixation in order to reduce caudal portion of fem neck. the screws are angled differently by placing them perpendicular to the fem neck fx line (typical AO technique) or horizontal to the floor. The screws here are similar to elderly fem neck fx types. Therefore, no biomechanical advantage exists and the nonunion is produced. 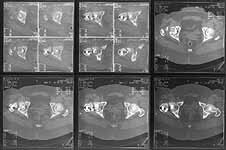 You need to perform a valgus osteotomy with 130 osteotomy plate. This will improve the relative Pauwells' angle and improve the union rate. Problem is the probable nonunion or partial union to the shaft. The osteotomy plate is only made with 6 holes which will not allow for bypassing the shaft problem. You will probably require an open plating and bone grafting. Try to angle your distal ost and prox shaft screws so that they overlap and theoretically decrease the stress riser created with the double plates. I agree with your assessment re: the neck, and think that ORIF of the femoral shaft is a good option. 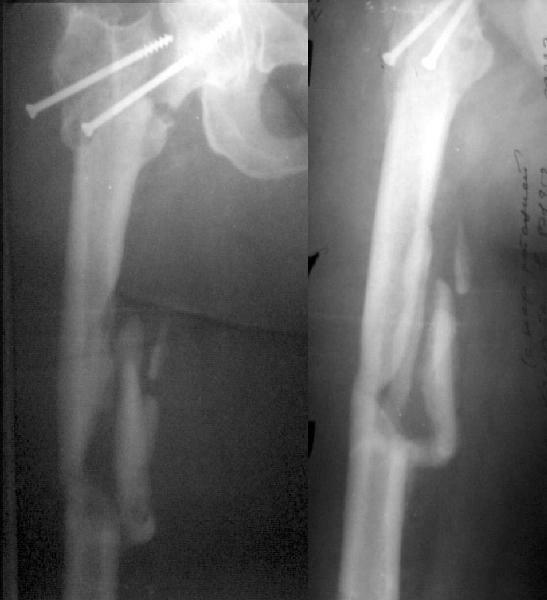 However, why not address the shaft component with a retrograde nail (AAOS OKU Trauma 1996)? You could perform the osteotomy in the usual way, secure the side plate to the proximal shaft initially with unicortical screws, complete the retrograde nailing procedure, then re-secure the side plate with bicortical screws directed around the nail. This would eliminate your concerns regarding the stress riser, and might be more practical then ORIF in this obese patient. I haven't done this with proximal femoral osteotomies per se but I've done it for shaft fractures with certain associated femoral neck or intertrochanteric fx patterns treated with a retrograde nail and DHS. One potential problem with recommending treatment options for the femoral neck nonunion is that we have no idea what the femoral neck alignment looks like on the lateral view. CB> unicortical screws, complete the retrograde nailing procedure, then re-secure the side plate with bicortical screws directed around the nail. This is very close to my view. This view was obtained in abduction + ext. rotation. CBJMD> This is a good example of sub optimal placement of the neck screws. IMHO the key problem here was neck malreduction. The biggest problem here is the femoral neck nonunion in a 44 yo obese (?weight) patient. No femoral head AVN apparent on plain xray but a significant fracture gap with a verticle fracture line on AP. If you can get that to heal you will be doing her a great service. The femoral shaft is still secondary. A valgus producing osteotomy (subtrochanteric, lateral closing wedge) combined with hip screw side plate may give the best chance of healing the femoral neck. 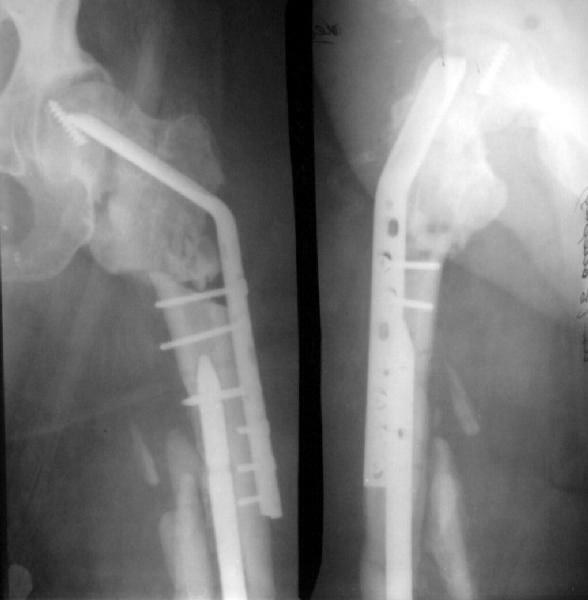 Whether or not to open the femoral neck fracture site, bone graft it or use additional fixation are all considerations. Many subsequent options for the femoral shaft but concentrate your attention on getting the femoral neck healed. 1. surgeon tends not to always pay close attention to the femoral neck. 3. femoral neck fixation is not optimal. The position in the head is difficult to visualize radiographically (esp lateral) the position in the head is hard to change (for recon nail only; nail must be rotated or backed out or in) the fixation screws are not optimal. Miss-A-Nail is not a fixed angle device and not much prevents the screws from allowing the neck to drop into varus. Typicallly fewer screws in less good position than when screws are used alone. Recon screws not as large as DHS, the diameter of the threads and screw shaft are the same and the screws don't slide very well in the nail; preventing compression. Femoral neck shaft combination is a big injury and not all do well regardless of the treatment chosen or how well it is done. A neck/shaft fx summary link from Bob Winquist's OTA BFC Lecture. Also, thanks to Tracy Watson for a recent reference. A subtrochanteric osteotomy was performed (a bit distally), after compression the lower crew was replaced with 3 monocortical. Then retrograde reaming was performed and UFN 12 mm was inserted and locked statically (with proximal screw through the plate). The neck gap looks well compressed. Image attached. Comments are welcome. What activity level is planned? Keep a close eye on the femoral head and neck. They will determine outcome, primarily.